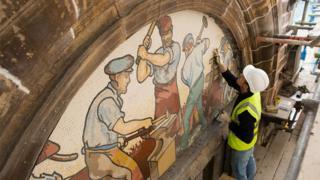 A set of mosaics that recall Inverness' industrial past have been reinstalled following restoration work. The artwork has been put back in place on the facade of the former Rose Street Foundry building, also known as AI Welders, in Academy Street. The property is also being refurbished and all of its floors are to be returned to use. Last year was 125 years since it first opened as the Rose Street Foundry and Engineering Company's head office. The set of the mosaics were added to the building in 1896. Inverness Townscape Heritage Project has been leading the efforts to revamp the vacant site. Highland Council is partly funding the work. Those involved in the restoration project said they were in awe of the "enduring" and "bright artistic effect" of the mosaics.